Some species can be found in purple moor and rush pastures. Angelica species grow to 1–3 m (3 ft 3 in–9 ft 10 in) tall, with large bipinnate leaves and large compound umbels of white or greenish-white flowers. Their large, sparkling, starburst flowers are pollinated by a great variety of insects (the generalist pollination syndrome), the floral scents are species-specific, and even specific to particular subspecies. 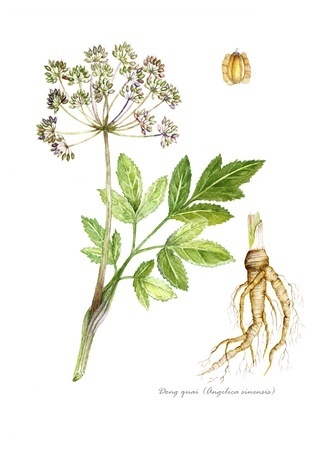 The active ingredients of angelica are found in the roots and rhizomes and contains furocoumarins in its tissues which make the skin sensitive to light. Some species are grown as flavoring agents or for their medicinal properties. The most notable of these is garden angelica (A. archangelica), which is commonly known simply as angelica. Natives of Lapland use the fleshy roots as food and the stalks as medicine. Crystallized strips of young angelica stems and midribs are green in colour and are sold as decorative and flavoursome cake decoration material, but may also be enjoyed on their own. The roots and seeds are sometimes used to flavor gin. Its presence accounts for the distinct flavor of many liqueurs, such as Chartreuse. Among the Sami people of Lapland, the plant is used to make a traditional musical instrument the fadno. Seacoast angelica (A. lucida) has been eaten as a wild version of celery. In parts of Japan, especially the Izu Islands, the shoots and leaves of ashitaba (A. keiskei) are eaten as tempura, particularly in the spring. A. sylvestris and some other species are eaten by the larvae of some Lepidoptera species, including bordered pug, grey pug, lime-speck pug and the V-pug. A. dawsonii was used by several first nations in North America for ritual purposes. A. atropurpurea is found in North America from Newfoundland west to Wisconsin and south to Maryland, and was smoked by Missouri tribes for colds and respiratory ailments. [medical citation needed] This species is very similar in appearance to the poisonous water hemlock. The herb, also known by the Chinese name, Bai Zhi, and Latin name, Radix Angelicae Dahurica, is used medicinally in traditional Chinese medicine.